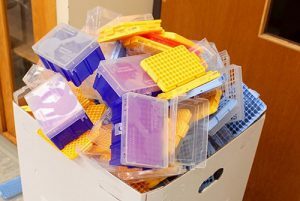 Several years ago, Brenda Lemos and David Waterman, at the time Brandeis graduate students working in Jim Haber’s lab, noticed that clean, polypropylene (#5 plastic) pipette tip boxes were being thrown away. Although never contaminated in the lab, these boxes are typically labeled “medical waste” and blocked from recycling, ultimately ending up in landfills. This is a problem given that 10 million pipette boxes are purchased each year and most often can’t be reloaded and reused. The boxes end up becoming part of the 6 million tons of plastic waste that are produced by 20,500 research institutions world-wide. That is when the now Dr. Waterman and the future Dr. Lemos, created the GreenLabs Recycling program. Rather than the pipette boxes being disposed of in a landfill, they are now being diverted into recycling at the point of use by the people who are using them. The system works this way: GreenLabs Recycling places recycling bins at participating labs. Scientists in the labs place the pipette boxes into the recycling bins as they are used. “Participation in this program has been great. 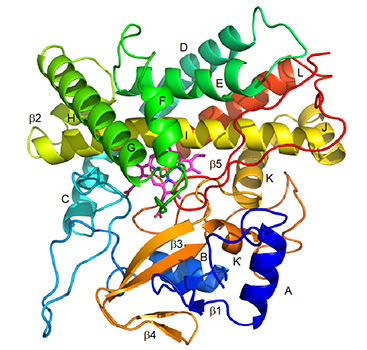 Other scientists understand the importance of recycling these materials,” David said. Brenda and David collect the bins and bring the materials back to a facility in Acton. There the boxes are sorted by cleanliness, color and type of plastic. After sorting, the boxes are granulated and used at local manufacturers. They prefer to use Massachusetts-based manufacturers in order to reduce the environmental impact of shipping the materials. They are currently collecting lab plastics at five locations – Brandeis, other universities, and small and large biotech companies in the area. They expect to be soon working with two additional locations. What are the future plans for GreenLabs Recycling? David said that they would eventually like to take the recycled plastics and manufacture their own long-lasting, permanent products such as trash cans, recycling bins, and non-disposable office products. David credits the Brandeis Innovations Sprout Program and Icorp™ Program for their support. “They have been a huge help”, he said. GreenLabs will be participating in the Mass Innovation Nights event on Thursday, March 14. This event will be held from 6:00 to 8:00 PM at the Faculty Club and features new, innovative products from Brandeis students, alumni, and staff. This event is free and open to the public. 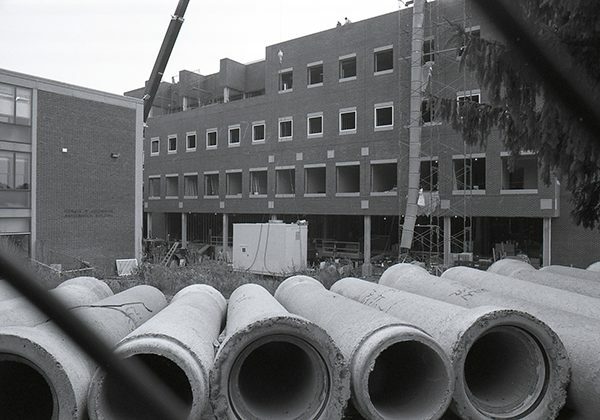 Since its construction at the heart of the Brandeis campus, the Volen National Center for Complex Systems has been a key focal point of the Brandeis campus. 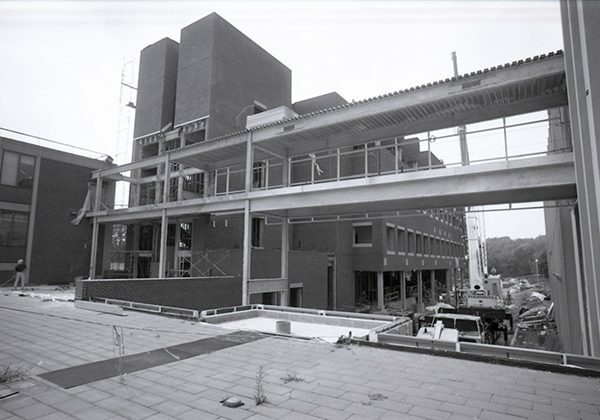 The structure was dedicated on October 20, 1994 and has served as a gateway to the Brandeis Science Complex for the past 25 years. 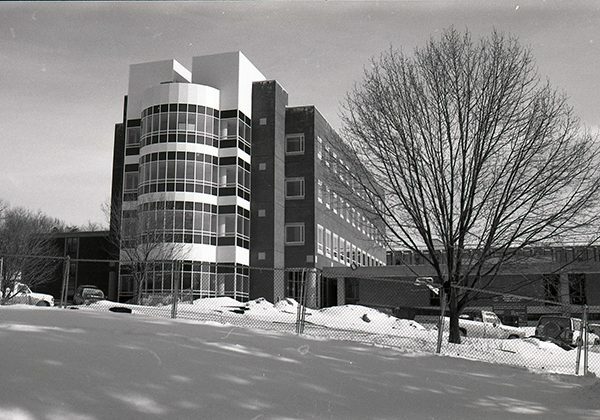 Planning for the construction of the building began in 1989 with funding from the federal government. Additional funding from the government and donations from benefactors followed. The total cost of construction was over $31 million. The Center’s primary focus is the study of one of the most complex of complex systems – the human brain and mind. 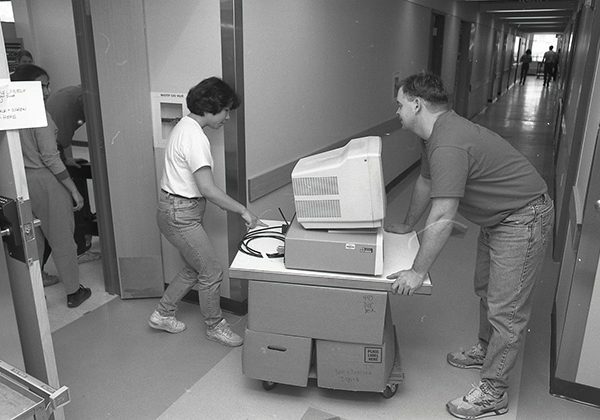 When the Volen Center was formed in 1989, its mission statement was “to advance our understanding of cognitive processes, perceptions, neuroscience, and the development and application of parallel computer systems.” As part of this mission, a retreat was first held in May 1989. This retreat has evolved into the annual Volen Retreat. True to the collaborative focus of the Center, the Volen Retreat includes talks from multiple disciplines of Brandeis faculty. 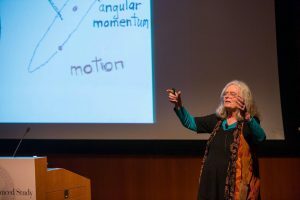 Thanks to the M. R. Bauer Foundation, a lecture series and week-long Distinguished Lecturer Visitors series brings scientists from all over the world to the Brandeis campus to talk about their research and interact with faculty, postdocs and graduate students. 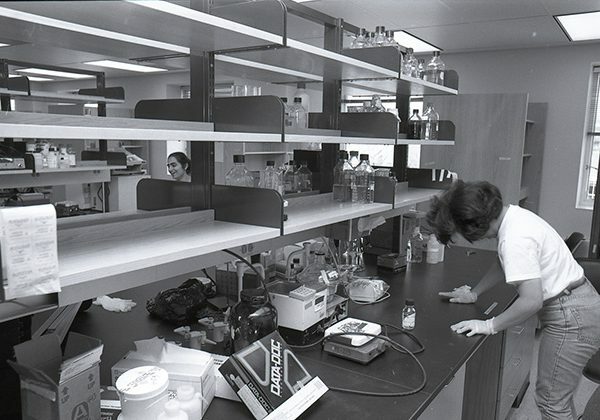 The bricks and mortar of the Volen Center provided essential office and lab space. 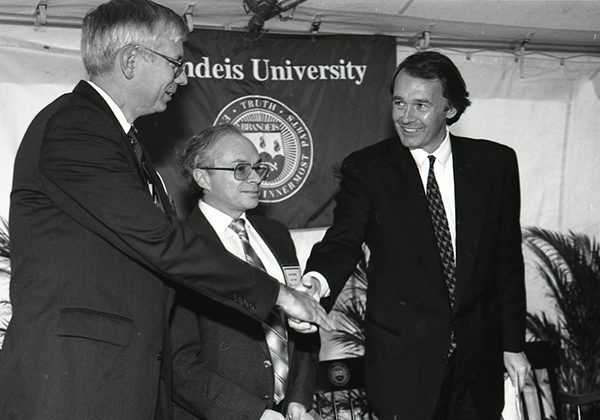 In addition to the building, new Brandeis faculty became a part of the Volen Center. 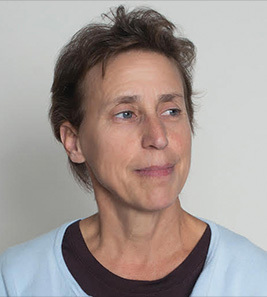 Leslie Griffith joined the Center in September 1992. Susan Birren followed in July 1993 and Jordan Pollack in September 1994. 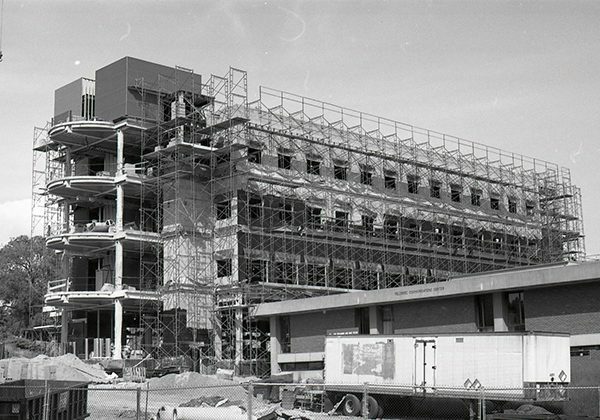 Faculty and labs of Computer Science, Linguistics, Biochemistry and Neuroscience moved into the completed structure in May 1994. 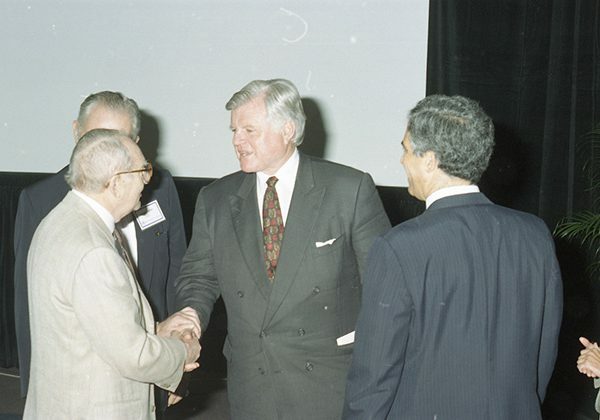 What has been impact of the Volen Center? 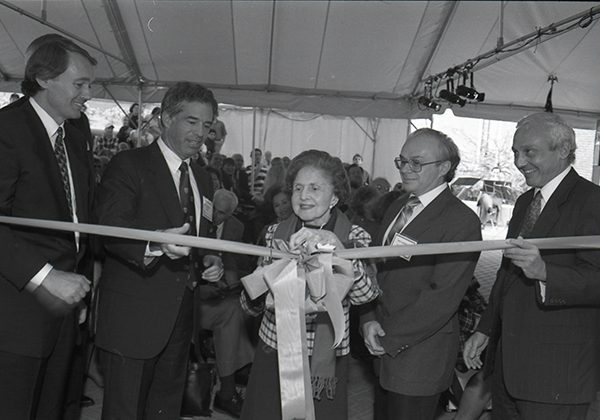 Barbara Wrightson, who was the Program Project Coordinator during the Volen construction and is now the Director of Budget and Planning in the Office of the Dean of Arts and Sciences, said that “the Volen Center helped to nurture the fabulous growth of the neuroscience program at Brandeis.” Additionally, shortly after moving into Volen, the Computer Science department experienced a boom in enrollment. 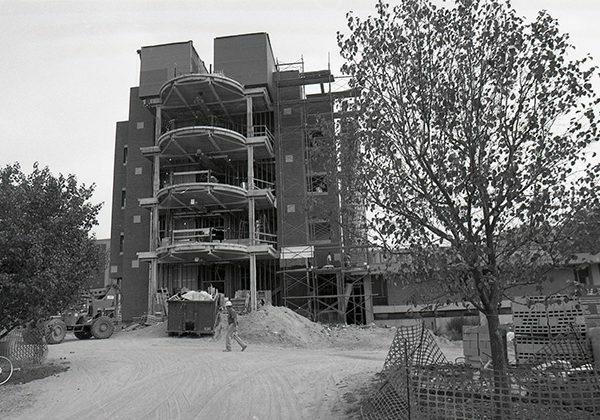 The department saw it’s enrollment double in the decade after the Center opened.